Kids are daily exposed to the theory of evolution by the media and public schools. It’s not safe to assume that your kids will reject that theory. It’s up to us as parents and Christian leaders to make sure our children know the truth about the creation of the world. 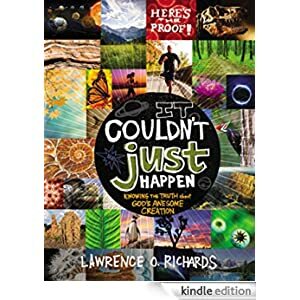 With thousands of evidences to prove He created and sustains the universe, It Couldn’t Just Happen will fascinate kids with fun activities and examples of God’s marvelous works. Suitable for ages 8-12, this book is selling for $1.99 today.